We stopped for some lunch out at the Cafe Zest in a branch of House of Fraser. As I scanned the usual suspects of cold drinks I spotted this bottle in the refrigerated area. I picked it up and realised it was another new J2O flavour for Spring! I recently reviewed the new Rose Garden variety and as J20 flavours don’t come out at that often, this bottle surprised me. 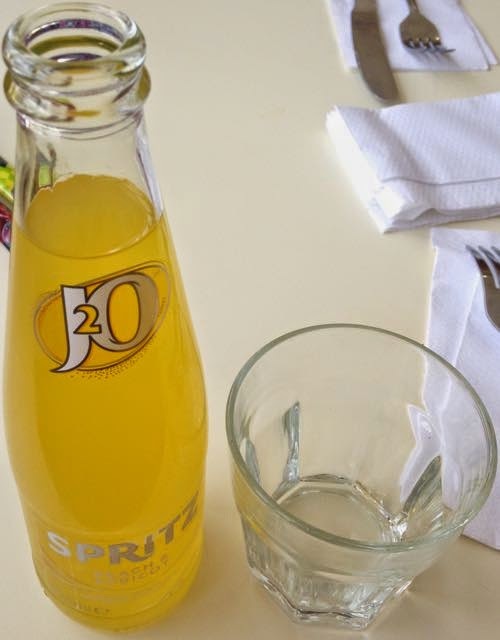 It is a new range from J20 called Spritz, and a new innovation to the brand is that it is also fizzy! The lid hissed a little when it was released, and I poured some out. The bubbles weren’t too heavy and the drink had a light fizziness to it. The flavour wasn’t too sweet, it was far calmer than the still juice based J2Os, mild but refreshing. The fruit taste was gentle, but the peach and apricot had a light honeyed taste that was very easy to drink. It was very refreshing and went perfect with our sandwiches out. When I got home I had a look on the Ocado website and found that the Spritz range is available on their website, not only that but it is available in large sharing bottles! There are two other flavours too, Apple and Watermelon as well as Pear and Raspberry. The Watermelon one in particular sounds rather adventurous and interesting so that is on my next order! J2O are really going for the new products this year and I can’t wait to try out the other new Spritz flavours. They are going to be perfect for the warm weather and, I’m hoping I’m not jinxing it, barbecue season.